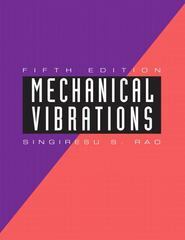 Mechanical Vibrations 5 Edition Mechanical Vibrations, 5/e is ideal for undergraduate courses in Vibration Engineering. Retaining the style of its previous editions, this text presents the theory, computational aspects, and applications of vibrations in as simple a manner as possible. With an emphasis on computer techniques of analysis, it gives expanded explanations of the fundamentals, focusing on physical significance and interpretation that build upon students' previous experience. Each self-contained topic fully explains all concepts and presents the derivations with complete details. Numerous examples and problems illustrate principles and concepts.